To be honest, the copy of The Opposite of Hate: A Field Guide to Repairing Our Humanity by Sally Kohn languished on my pile of books to read longer than I anticipated. The reason, as I discovered later in Kohn’s book—it is easier to cling to one’s own biases and stew about the other side. I doubted that this book could help boost my optimism, but I was wrong. taking sides and start a conversation, and she brings a unique perspective to this topic with a career that has touched the entire political spectrum. As an openly gay woman, she has been a strong voice for LBGT and progressive causes, as well as an active community organizer. Currently a columnist and a political commentator for CNN and MSNBC, a key element of Kohn’s resume includes a spot as a former liberal commentator on the Fox Network. engaging journey of discovery—especially given the topic. Kohn does not give herself a free pass, and her honest observations as she bravely explores what most of us would rather ignore, are powerful. tell us to change who we are, nor does she whitewash the fact that overcoming hate is hard. Taking the time to read The Opposite of Hate is well worth it. Our current environment of vitriol is corrosive in so many ways, especially as an example to the generation now growing up amidst all of it. Kohn’s final takeaway is that we all have the power to do something. 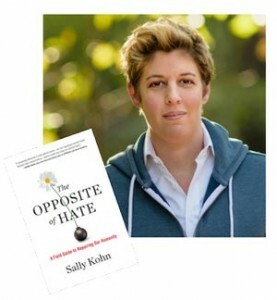 Sally Kohn will be at the Sandler Family Campus on Thursday, November 29 at 12 pm. 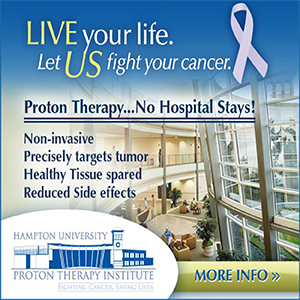 For information, contact Callah Terkeltaub at cterkeltaub@ujft.org or 757-321-2331. Wendy Juren Auerbach is the past chair of the Holocaust Commission of the United Jewish Federation of Tidewater.